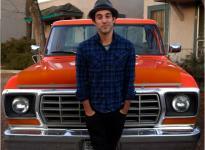 Joshua Radin's new single 'One Of Those Days' has a strange sense of familiarity. That could be because as a close friend of Zach Braff, his music has been featured numerous times on the soundtrack for Scrubs. More likely, it's because he sounds like most other acoustic American singer/songwriters. That's not a bad thing though, because Radin knows how to produce catchy yet melancholy songs that are well worth listening to. It's no surprise that Rob Schnapf has been involved here either, as he produced the best of the late Elliot Smith's work. In fact, Smith is probably the best comparison to make when listening to 'One Of Those Days'. The song rewards multiple listens partly because of the great orchestration of the music, which has a number of different layers. But it's also a great showcase for Radin's trademark 'whispering' vocals. Lyrically, it's easy to relate to as a song about coping with loss. "So I crawl underneath my blanket/Where I can hide away" is a sentiment that everyone has shared at one time or another. It's obvious that Radin can inject real emotion into folk tinged pop songs that hold your attention. That alone should be the reason to investigate further and listen to his new album Simple Times. But it really depends on whether acoustic rock appeals to you. If it does, 'One Of Those Days' is a great undiscovered gem. For everyone else, it's unlikely you'll be won over on the strength of this song alone. Please direct any comments and questions to the address below. © Daily Music Guide. All rights reserved. Design: HTML5 UP.